For craft and specialty beer enthusiasts who are tired of typical pub-fare food and limited beer choices, the Brick Anchor Brew-House will transcend the expected. Offering 60 craft beer selections on tap, 40 bottles/cans, and food offerings which will enhance your experience through thoughtful pairings, we hope to be your destination of choice for good food, beer and company. We'll see you at the Brick! 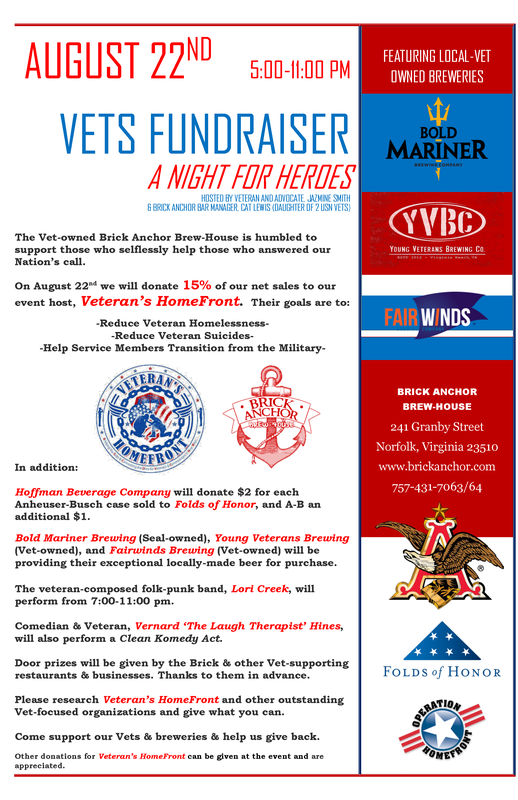 VETS FUNDRAISER 8/22 5-11PM Seven Venues - Take the Night Off MenuVeer Mag Awards: Vote for the Brick! Our goal at the Brick Anchor Brew-House is to provide you a home away from home while bringing you the world one glass at a time. Our knowledgeable staff will assist you in selecting the perfect beer to compliment your meal.... or to just enjoy all by its frothy self. Although you might come in for the beer or live entertainment, you'll also stay for the food. Our thoughtful menu selections will be a blend of international, national and Hampton Roads...much of it paired to our beer on tap to heighten your experience. Many fine beers to select from, with 60 options on tap, and 20 from the state of Virginia and local Norfolk breweries! Most of our thoughtful menu selections will be paired to our beer on tap to heighten your experience. 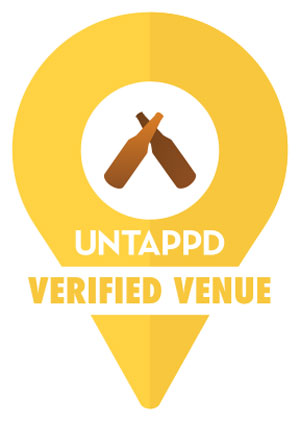 We'll be hosting many exciting live events and offering other fun events for those who wish to explore beers and unique cuisines. Learn more about our selection and the other businesses that have been awarded grants to help create new vibrancy in Downtown Norfolk, here. Looking for a unique atmosphere to host your next big event? 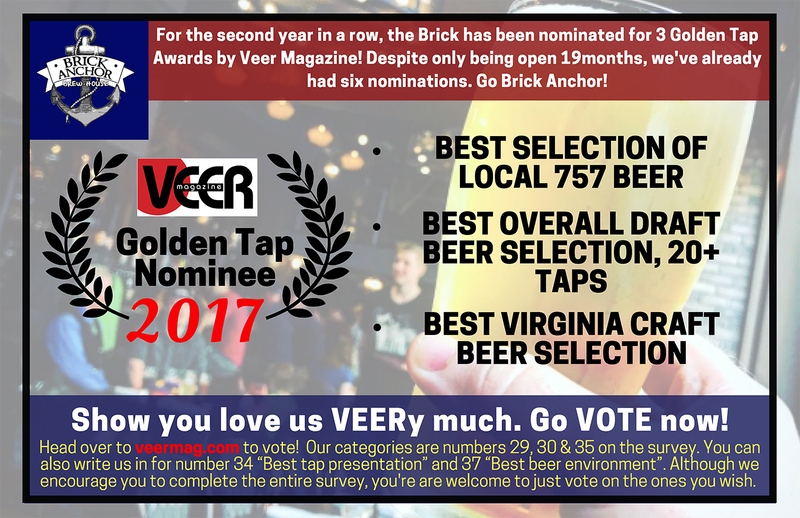 If you are searching for that perfect place to hold an event at a unique location offering 60 craft beers on tap and 100 beers total and delicious food to match, the Brick Anchor in downtown Norfolk might be the place for you. Although not required, you can make reservations for Monday-Thursday & Sundays by calling 757-431-7064 or emailing info@brickanchor.com; we strongly recommend parties of 8 or more make reservations. Aside from scheduled events, we do not accept reservations for any sized party on Friday & Saturdays after 6:00 p.m. On those dates, seating will be on a first-come, first-served basis. You might come for our beer, but you’ll stay for our food. Serving lunch, dinner, and weekend brunch options, our menu is ‘sophisticated casual’ with an emphasis on farm-to-fork offerings and a deep engagement with, and support for, our regional farmers. Our focus is on bringing our community the wealth of choices it deserves. And our 60 taps will deliver many choices, with half of them dedicated to, and supporting, the breweries of Norfolk, Hampton Roads, Virginia and mid-Atlantic areas. We will bring in local brewers to share their knowledge with our patrons, host frequent beer pairing events, and provide growler services for customers to enjoy our wide beer selection in the comfort of their own homes. Which Local Craft Beers Pair Best with Halloween Candy? Get in touch with us. Feel free to drop us a line even if you just want to say hello.